Save 50%! Originally $2.70 per pack. Limited time offer, order TODAY! Program and registration ca..
Save 10%! Originally $2.70 per pack. Limited time offer, order TODAY! 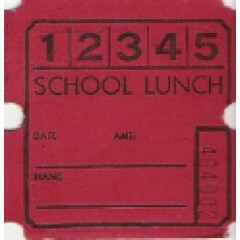 School enrollment card. ..
Save 50%! Originally $2.70 per pack. Limited time offer, order TODAY! 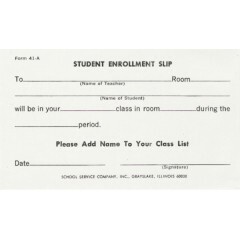 Enrollment and program card..
- Padded school book labels. - Bond paper padded. 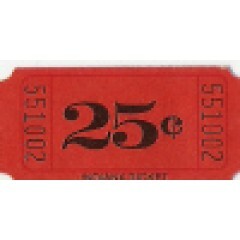 - Includes adhesive backing to stick on..
DISCOUNT - Roll tickets. - Limited supply, order today. - 1 x 2 size tickets. - R..
Discount Save 50%, Limited time offer, order TODAY! 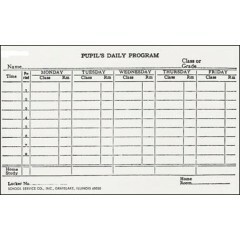 - Student's daily program card - 3 x ..
Discount Save 50%, Limited time offer, order TODAY! 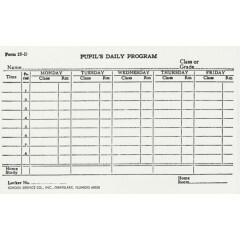 - Student's daily program card - ..
Discount Save $3.00, Limited time offer, order TODAY! 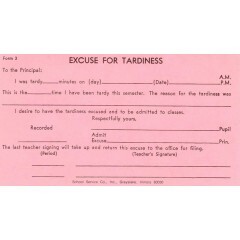 Padded excuse for tardiness. Size: 3 x 5..
50% Discount - Limited time offer - order TODAY! - Padded purchase order. - 7 x 8 1/2 size. ..
Discount Save $1.00, Limited time offer, order TODAY! 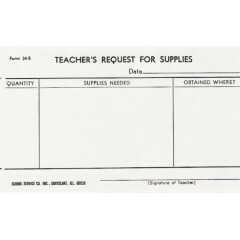 Padded teacher's request for supplies. S..
Discount Save $1.00, Limited time offer, order TODAY! 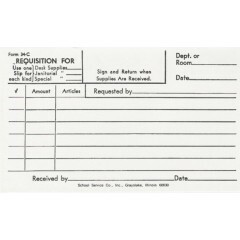 Padded requisition slip. 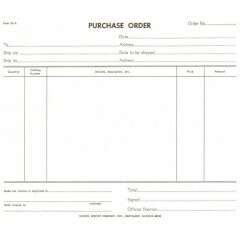 Size: 3 x 5 siz..
50% Discount - Limited time offer - order TODAY! 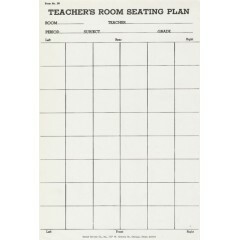 - Padded teacher's room seating plan. - ..
Discount Save $3.00, Limited time offer, order TODAY! 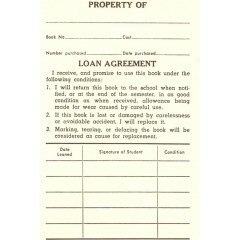 Padded student enrollment slip. Size: 3 ..
Discount Save $1.00, Limited time offer, order TODAY! 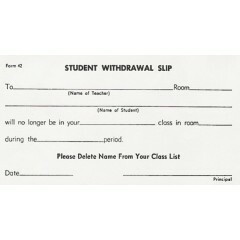 Padded student withdrawal slip.. Size: 3..
Discount Save 50%, Limited time offer, order TODAY! 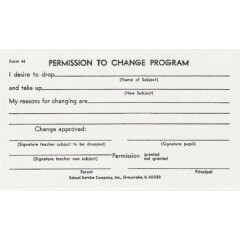 Padded permission to change program. 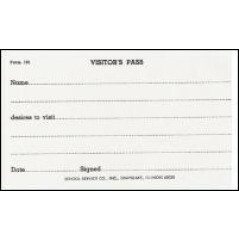 Size:..
DISCOUNT blank envelopes. (Only 4 packs left in stock) - May be used as coin envelopes..
Discount Save 50%, Limited time offer, order TODAY! 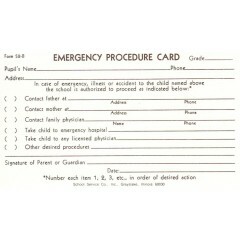 Emergency procedure card. 3 x 5 size. ..
Discount Save 50%, Limited time offer, order TODAY! 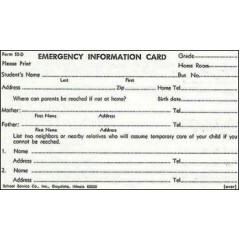 Emergency information card. 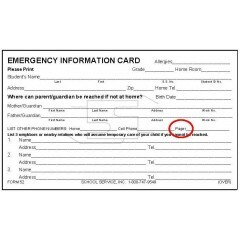 "May Aspirin..
Old style emergency card with a check box asking what medications may be given. With line for "..
Discount Save $1.00, Limited time offer, order TODAY! 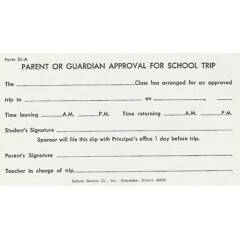 Padded parent approval for school trip. ..
Discount Save 50%, Limited time offer, order TODAY! 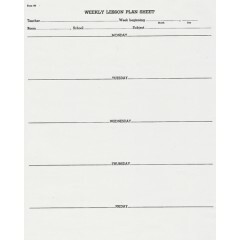 Padded weekly lesson plan sheet. Size:&nbs..